Ouch!!! Your FPM application suddenly ended with a dump or an unexpected behaviour. If you have fallen into this trap, probably one of the following quick and easy rescue measures could help or bring you at least one step forward. Issue: FPM application cannot be started. 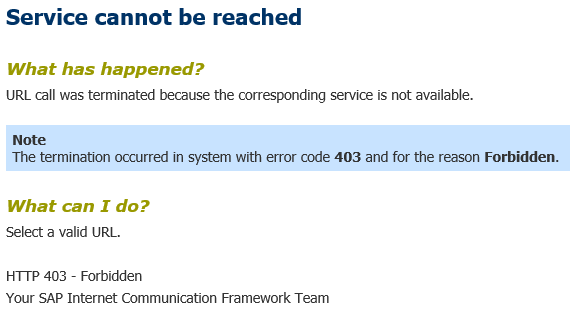 It gives an error message with error code 403. See the screenshot below. The root cause of this scenario is a non-active ICF-Service. Enter transaction SICF and activate the appropriate ICF-Service of your FPM application. Enter the name of the FPM application as Service name and execute the report. Right-click the ICF-Service and select “Activate Service”. Issue: A text has not been translated – it appears in the original language. Read my blog All about Translation and Texts of FPM applications. There you will most probably find an answer. Or directly start transaction FPM_TEXT_TOOL which has a little blue Info-button on top which gives you further information. Issue: When starting an FPM application you directly get the error message “FPM application <XYZ> was started without configuration”. Every FPM application has an application configuration assigned which provides the information with which floorplan configuration the application should start. In many cases the name of the application configuration has the same name as the application itself – only then no dedicated application configuration has to be passed. In all other cases you have to pass the name of the application configuration, depending on from where you start the application (e.g. via URL-Parameter sap-wd-configid=”…”, portal settings, …). Issue: The FPM application suddenly ends up with an ASSERT statement. In the runtime error analysis (ST22) you recognize that it seems that the name of the feeder class is missing. This error comes up when a GUIBB exists within the floorplan configuration where no feeder class is assigned – or when the floorplan configuration has a GUIBB included which has no valid configuration name assigned. You can directly check both points from above within the underlying floorplan configuration. If you don’t know which GUIBB is affected search in the trace of ST22 for text string “IV_COMPONENT_NAME”. There you will find the name of the affected UIBB as well as some other data, e.g. the configuration name as well. Issue: You recognize that the Work-Protect-Mode does not work as you expect, e.g. the data loss popup does not appear even if new data has been entered. Read the blog about Work Protection in FPM applications written by my colleague Christian Günther. He describes in an understandable way which work protect modes exist and some technical background. Furthermore you will find some notes leading to solutions of currently known issues. Issue: Your application suddenly ends with the message “Raising an FPM event is not allowed at this point in time”. Check first whether notes #2426982 and #2158960 are applicable and have already been applied into your system. If this check was successful and the above issue still occurs please read my blog about the FPM event loop. There you find a section at which point of time you are allowed to raise FPM events. Issue: The FPM application terminates with the message “Access via ‘NULL’ object reference not possible”. Analyse the dump with the Runtime Error Analysis (transaction ST22) whether the root cause is coming from method PREPARE_NAVIGATION of view CNR_VIEW. If this is the case most probably your floorplan configuration contains an invalid UIBB (either with a missing UIBB-interface or with not valid entities in FLUID). Issue: You have some scrollbar issues or UIBB display issues within your FPM application. Issue: The FPM application doesn’t respond at all (screen freeze). Issue: None of the above issues describe my problem. If you like to dig deeper into your FPM application to find out what is wrong, my other blog Analyzing your FPM application could give you a further insight. This blog will be updated from time to time – so stay tuned!